Welcome to The Naturopathic Kitchen! Each week we cover tips on how to incorporate new foods and herbs into your routine and also share their health benefits. Through this series, we make it easy to learn more about food as medicine. This week is all about licorice root! Most of us know licorice as the black ropey candy with a distinct flavor. Did you know the candy is actually enhanced with anise? Licorice root on it’s own has a long history of use as a medicinal and flavor enhancing plant. At one point, the Food and Drug Administration issued a consumer update advising against eating large amounts of licorice candy for long periods of time, especially for those with heart conditions or high blood pressure. While caution is advised for certain groups, there are still many reasons to enjoy licorice in moderate amounts, as the health benefits are too good to ignore. Where does licorice come from? Where can I find it? Licorice has its roots (pun intended) originating in southeast Asia, the Middle East and southern Europe. Throughout history it has been appreciated for its sweet flavor which comes from the glycyrrhiza—a compound fifty times sweeter than sugar! Today, licorice can be found in all kinds of forms, from candy to alcoholic beverages and even cosmetic products. Licorice candy may be found in almost any store where candy is sold. The root however is best found online or through trusted botanical vendors. You can also find licorice extracts sold in health food stores. Whichever form you get it in, licorice is best used for short periods (6 weeks) of intake at no more than 6 to 18 grams of standardized extract per day. Due to its potent activity, it is good to give the body a period of rest rather than taking it as a daily supplement indefinitely. How does licorice help my health? What medical conditions/symptoms is licorice good for? When should licorice be avoided? It is possible however to get licorice supplements with the glycyrrhizin removed which still has plenty of health benefits without as many of the side effects. Let’s try licorice out with delicious and nutritious recipes! Licorice root pairs well with sweet and salty entrees. For more savory dishes, add a stick of licorice root to a pot roast or braise (beef, pork or lamb). For sweeter drinks or entrees, licorice pairs well with other bold flavors such as raspberry, ginger, mint and rhubarb. Want to spice up your regular morning oatmeal? Try grating some licorice root over it – but not if you are pregnant! 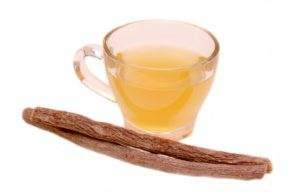 Adding the licorice root prior to cooking the oatmeal will allow for the root to steep which will intensify the flavor. Goodbye, boring oatmeal, hello flavor! Fill saucepan with water on medium heat. Before the water begins to boil, add the dried licorice roots. Bring to a boil. Remove from heat, add ginger and allow the mixture to steep for 5-7 minutes. Use a fine mesh strainer to filter the licorice root out as you pour the tea into a cup. Discard the filtered roots. Thank you to StyleCraze for this recipe.